l Hot Raspberry Barbecue Sauce: 19 OZ. Home > Shopping Store > BBQ Sauces Shopping Cart > Hot Raspberry Barbecue Sauce: 19 OZ. 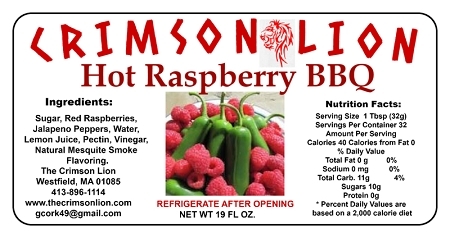 Add a hot raspberry flavor to your barbecued meats this season. Ingredients: Sugar, Red Raspberries, Jalapeno Peppers, Water, Lemon Juice, Pectin, Vinegar, Natural Mesquite Smoke Flavoring.